A few weeks ago, I made mugi miso soup. It’s so easy and quick to prepare that I even make miso soup for breakfast when I run out of ideas to feed my family. This is another quick meal that can be completed within 30 minutes. 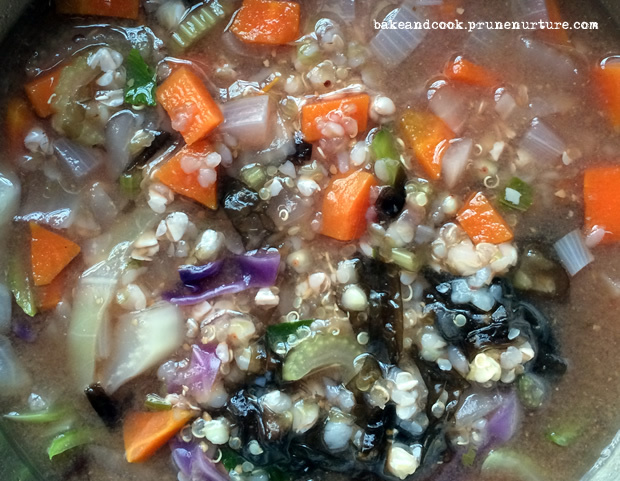 Add water and carrot, onion, quinoa and buckwheat to a pot and bring it to boil. Adjust to medium fire and cook for about 20-25 minutes. Check that the buckwheat and quinoa are cooked. Adjust to low fire, add cabbage, celery and pak choy and cook for another 3-5 minutes. Off the fire. Add the miso paste so as to preserve the live koji cultures in miso and to retain as much nutrients as possible. Adjust the taste according to preference. Add seaweed and it is ready to be served.